WASHINGTON — Well, today, it's Roger Stone's time in the barrel. The headline this morning is that Stone, the former adviser to President Donald Trump, was charged by special counsel Robert Mueller of obstruction, giving false statements and witness tampering — making him the latest Trump associate to get indicted or plead guilty. But inside of Mueller's indictment is an even bigger story: a list of the times when Stone was communicating with the Trump campaign and its associates about the WikiLeaks email releases that ended up rocking Hillary Clinton's campaign in the final month of the 2016 presidential election. "Shortly after Organization 1's release, an associate of the high-ranking Trump Campaign official sent a text message to STONE that read 'well done.'" (Page 9). Why does Stone talking to the Trump campaign about WikiLeaks matter? Because Trump and his campaign seized on the WikiLeaks disclosures during the last month of the 2016 election, with Trump mentioning the word "WikiLeaks" some 140 times in that final month, per NBC's count. The caution here: Mueller's indictment clearly shows collusion/cooperation between the Trump campaign and WikiLeaks. What we don't know is if Stone and the Trump campaign knew that WikiLeaks might have been a front for Russian intelligence — since it was Russian intelligence that hacked the Democratic emails. Stone has denied being involved in any collusion. June 9: Donald Trump Jr. — along with Jared Kushner and former campaign chair Paul Manafort -- meets with Kremlin-connected lawyer Natalia Veselnitskaya. Oct. 31 in Warren, Mich: "Did you see where, on WikiLeaks, it was announced that they were paying protesters to be violent, $1,500?... Did you see another one, another one came in today? This WikiLeaks is like a treasure trove." Nov. 2 in Orlando, Fla: "WikiLeaks just came out with a new one, just a little a while ago, it's just been shown that a rigged system with more collusion, possibly illegal, between the Department of Justice, the Clinton campaign and the State Department." Nov. 4 in Wilmington, Ohio: "Boy, I love reading those WikiLeaks"
As for the partial government shutdown, which enters its 35th day, the activity on the Senate floor Thursday was bad news for President Trump: There were more votes for a ceasefire than for Trump's border wall. NBC's Rebecca Shabad, Frank Thorp and Marianna Sotomayor: "The Democratic measure, which would have reopened federal agencies until Feb. 8 but provided no funding for a border wall, was defeated in a 52-44 vote on Thursday. The Republican spending measure, which was proposed by Trump and included $5.7 billion for his border wall in exchange for temporary protections for so-called Dreamers brought illegally to the country as children, also fell short of the 60-vote threshold required for passage, 50-47." "Jared Kushner's application for a top secret clearance was rejected by two career White House security specialists after an FBI background check raised concerns about potential foreign influence on him — but their supervisor overruled the recommendation and approved the clearance, two sources familiar with the matter told NBC News." "The official, Carl Kline, is a former Pentagon employee who was installed as director of the personnel security office in the Executive Office of the President in May 2017. Kushner's was one of at least 30 cases in which Kline overruled career security experts and approved a top secret clearance for incoming Trump officials despite unfavorable information, the two sources said. They said the number of rejections that were overruled was unprecedented — it had happened only once in the three years preceding Kline's arrival." Kamala Harris today heads to South Carolina, where she attends the Pink Ice Gala hosted by Alpha Kappa Alpha sorority… Elizabeth Warren holds an organizing event in Las Vegas… Michael Bloomberg addresses the U.S. Conference of Mayors. This weekend: On Sunday, Harris makes her official campaign announcement from Oakland, Calif… John Hickenlooper attends a house party in Iowa… And Eric Swalwell also hits the Hawkeye State. More Mueller indictments! Government shutdown enters its second month! The State of the Union back-and-forth between Trump and Pelosi! Supreme Court takes its first gun case in nearly a decade: "The court granted a right-to-carry case out of New York that pits the New York State Rifle & Pistol Association against the City of New York. New York bans transporting permitted handguns outside city lines, even if the gun is not loaded and is locked in a container. The guns currently can only be taken to the handful of shooting ranges within city limits," per NPR. Judge denies Republican's request to certify disputed NC-9 election: "A North Carolina judge on Tuesday denied Republican Mark Harris' request to certify the still-disputed congressional race in the state's 9th Congressional District, saying that the North Carolina Board of Elections should complete its investigation before the court considers intervening," per NBC's Leigh Ann Caldwell. Democrats received more help from "dark money" groups than Republicans in 2018: "As Democratic presidential hopefuls promise not to boost their candidacies through spending by outside groups with cash from wealthy donors, sometimes given secretly, a new report says the party received most of the so-called 'dark money' spent on political ads in the 2018 midterms," per the Wall Street Journal. Sen. Joni Ernst says she was raped in college: "Republican Senator Joni Ernst says that she was raped in college by someone she knew and that her ex-husband physically abused her, making her one of the highest-profile women in her party to allege assaults in the era of the #MeToo movement," Bloomberg writes. 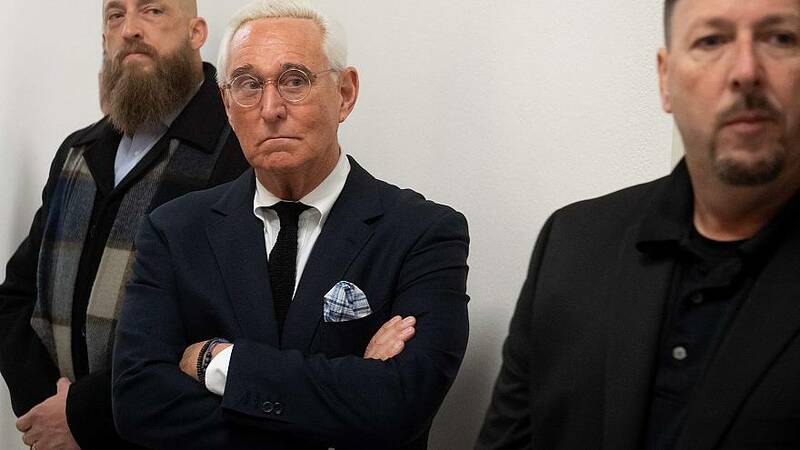 Breaking this morning: Roger Stone has been indicted by special counsel Robert Mueller and arrested on charges of obstruction, giving false statements and witness tampering. Michael Cohenhas been subpoenaed by the Senate Intelligence Committee. The Trump administrationis yet to impose new Russian sanctions as required by law. Trump now says he'll back a compromise plan between Mitch McConnell and Chuck Schumer to end the shutdown. Republican senators clashed over the shutdown behind closed doors,the Washington Post writes. Wilbur Rossis walking back comments that he doesn't "understand" why furloughed workers have turned to food banks. Another problemamidst the shutdown: The lure of predatory loans to furloughed federal workers. Carol Lee and Josh Lederman report on how the Trump administration's move on Venezuela came together. The Trump administration plansto start turning asylum seekers back to stay in Mexico to await their court dates. 2020: Warren proposes "wealth tax"
Elizabeth Warren is proposing a "wealth tax" on the ultra rich. Beto O'Rourke's campaign-in-waiting is, well, waiting. The Washington Post asks if there's a market for Joe Biden's campaign. Steve King has yet another 2020 challenger.